Please click the image below to view an enlarged detailed street map of Pattaya. Get Around in Pattaya – Baht Bus, Motorcycle Taxis etc. To find your way around Pattaya is fairly simple, even for first-time visitors who aren’t very good with directions. You will usually find a north-south orientation on maps of Pattaya, with Naklua situated to the north of the main city area, and Jomtien Beach in its own bay, just south of Pratamnak Hill. Pattaya’s main tourist, residential and entertainment areas are embedded between the coastlines of Pattaya and Jomtien in the West and Sukhumvit Road (that’s the kingdom’s longest road and goes all the way to Bangkok) in the East. The area east of Sukhumvit Road is also known as the “Dark Side”. Pattaya Second Road meets Naklua Road at its northern end at the Dolphin Roundabout, and changes its name to Pratamnak Road in South Pattaya. A few hundred metres south of the traffic lights at the intersection with South Pattaya Road, Pratamnak Road also connects with Thappraya Road. 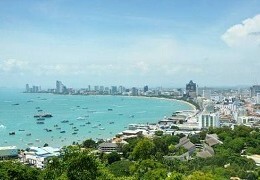 Both roads go across Pratamnak hill and are the main connections between South Pattaya and Jomtien. These main arterial roads are linked by either numbered side-streets (soi in Thai) or such that have been given names of relevant buildings or hotels. 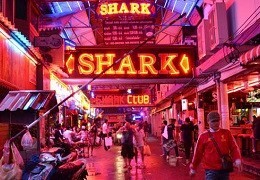 One of the longest side-streets in Pattaya – and an entertainment district in its own right, popular in particular with British tourists and expats – is Soi Buakhao, which runs parallel to Pattaya Second and Third Road and connects Pattaya Klang with Pattaya Tai. 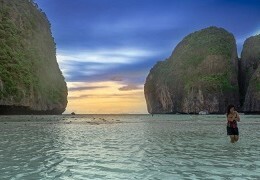 Jomtien Beach is situated in its own bay, just a few kilometres south of Pattaya. 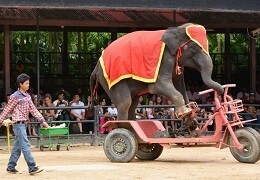 On average, it’s not more than a 10-minute “Baht bus” ride across Pratamnak hill to South Pattaya, Walking Street etc. To find your way around Jomtien is extremely easy. There are only two main North-South connections: Jomtien Beach Road and the relatively new Jomtien 2nd Road. 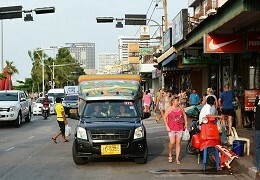 Jomtien Beach Road is the main taxi route to Pattaya and has several side-streets, some of which are cul-de-sacs, and two connections with Sukhumvit Road: Soi Wat Boon and Soi Chaiyapruek. The construction of Jomtien 2nd Road (which links Thappraya Road with the southernmost areas of Jomtien) has basically been finished by 2015; other than being a shortcut for motorists, however, it’s still of little significance only for holidaymakers. Same as in Pattaya, the side-streets at Jomtien are either numbered or have been given names of relevant buildings or hotels. Pattaya’s characteristic blue “Baht bus” taxis drive up and down Jomtien Beach Road basically 24/7 (though less frequently in the night) and connect Jomtien with South Pattaya. When you take a Baht bus from anywhere along Jomtien Beach Road and and travel northwards, you can be sure that about 10-15 minutes later, you will find yourself across the hill in Pattaya. If you just jump on the back of a Baht bus (i.e. not charter it as a taxi) the trip to South Pattaya shouldn’t cost you more than 10-20 Baht. As elsewhere in Thailand, motorbike taxis can also be found at virtually every street corner. Where Jomtien Beach Road branches off the coastline at the police box in Jomtien’s North, it changes its name to Thappraya Road. This is the main taxi route to Pattaya and goes all the way across Pratamnak hill to South Pattaya, where it eventually merges into Pattaya 2nd Road. Just a kilometre up the hill, there’s a junction with Thepprasit Road, which is the main link between Jomtien and Sukhumvit Road. 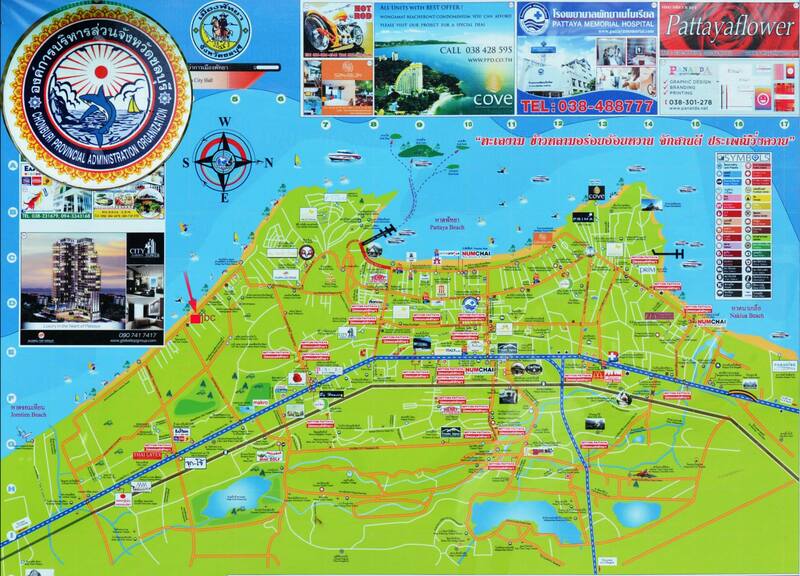 Printed maps of Pattaya are easy to pick up, e.g., in your hotel lobby, many restaurants, travel agencies etc. 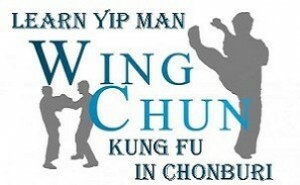 They are usually distributed free or can be found in many tourist magazines. The widely distributed Thaiways’ Map of Pattaya – a detailed street map that shows most places of interest around Pattaya and Jomtien – can be obtained free from the information counter at airports and in most hotels.